This name uses Spanish naming customs: the first or paternal family name is Álvarez and the second or maternal family name is Ventosa. Yadier Álvarez Ventosa (born March 7, 1996) is a professional Cuban baseball pitcher for the Los Angeles Dodgers of Major League Baseball (MLB). Álvarez defected from Cuba to pursue a career in Major League Baseball (MLB). He has a fastball that touches 98 miles per hour. Scouts believe he has number two starter upside and one National League official has said that he is the best 18-year-old pitcher he had ever seen. He received interest from numerous MLB teams including the Philadelphia Phillies, Los Angeles Dodgers and Arizona Diamondbacks. Ranked as the second best prospect by mlb.com heading into the 2015 international signing period, Álvarez signed with the Dodgers on July 2, 2015, for a $16 million bonus. He made his professional baseball debut for the Dodgers Arizona rookie league affiliate on June 20, 2016 and struck out seven while only allowing one hit in 3​2⁄3 innings pitched. In five starts for the team, he was 1–1 with a 1.80 ERA and 57 strikeouts. He was promoted to the Great Lakes Loons of the Midwest League and struck out 10 in his debut for the Loons on July 21, 2016. He made nine starts for the Loons with a 2.97 ERA and 55 strikeouts in only 39 ​1⁄3 innings. In 2017, he was promoted to the Rancho Cucamonga Quakes of the California League and chosen to represent the world team at the All-Star Futures Game. Álvarez began 2017 with the Quakes and was promoted to the Double-A Tulsa Drillers at mid-season. Between the two leagues he made 18 starts (and three relief appearances) and was 4–6 with a 4.68 ERA. He returned to Tulsa in 2018 and was selected to represent the Drillers at the mid-season Texas League All-Star Game. In 17 games (eight starts), he went 1-2 with a 4.66 ERA. The Dodgers added Álvarez to their 40-man roster after the 2018 season. He returned to Tulsa to begin 2019. Matthew Thomas Beaty (born April 28, 1993) is an American professional baseball third baseman for the Los Angeles Dodgers of Major League Baseball (MLB). Beaty attended Dresden High School in Dresden, Tennessee. The Kansas City Royals selected him in the 48th round of the 2011 MLB draft, but he attended Belmont University. The Dodgers selected him in the 12th round of the 2015 Major League Baseball draft. Beaty signed with the Dodgers and spent 2015 with both the Ogden Raptors and Great Lakes Loons, posting a combined .314 batting average with four home runs and 28 RBIs in 68 total games between both clubs. He spent 2016 with the Rancho Cucamonga Quakes, compiling a .297 batting average with 11 home runs and 88 RBIs in 124 games, and 2017 with the Tulsa Drillers where he slashed .326/.378/.505 with 15 home runs and 69 RBIs in 116 games, earning him league player of the year honors. He also won the league batting title. He was assigned to play in the Arizona Fall League and was chosen for the Fall Stars Game showcase. Beaty played for the Oklahoma City Dodgers of the Class AAA Pacific Coast League in 2018, batting .277 with one home run and 12 RBIs in 31 games. The Dodgers added him to their 40-man roster after the 2018 season. He began 2019 with Oklahoma City. Joe Neville Broussard (born January 28, 1991) is an American professional baseball pitcher for the Los Angeles Dodgers organization. Broussard was drafted by the Dodgers in the 15th round of the 2014 MLB Draft out of Louisiana State University. He signed and spent 2014 with the Ogden Raptors where he went 2-2 with a 3.35 ERA in 18 relief appearances. In 2015, he played for the Great Lakes Loons and Rancho Cucamonga Quakes, pitching to a combined 4-4 record and 3.80 ERA in 38 games, and in 2016, he pitched for the Quakes, Tulsa Drillers, and Oklahoma City Dodgers, compiling a combined 4-2 record and 1.80 ERA in 50 appearances out of the bullpen. He spent 2017 with both Tulsa and Oklahoma City, posting a 5-1 record and 3.27 ERA with 73 strikeouts in 63.1 total innings pitched between the two clubs, and he played 2018 with Oklahoma City where he went 5-4 with a 3.12 ERA in 57 relief appearances. He returned to Oklahoma City to begin 2019. Jeter D. Downs (born July 27, 1998) is a Colombian-American professional baseball shortstop for the Los Angeles Dodgers organization. Downs is originally from San Andrés, Colombia. He was named after Derek Jeter. His father, Jerry Sr., played baseball professionally in Colombia. His family moved to the Little Havana neighborhood in Miami, Florida, when he was five years old. Downs attended Monsignor Edward Pace High School in Miami Gardens, Florida, and played for the school's baseball team as a shortstop. He committed to attend the University of Miami on a college baseball scholarship. The Cincinnati Reds selected Downs with the 32nd overall selection of the 2017 MLB draft. He signed with the Reds for a $1.825 million signing bonus. After signing, he was assigned to the Billings Mustangs of the Rookie-level Pioneer League, where he spent all of his first professional season, posting a .267 batting average with six home runs and 29 RBIs in 50 games. Downs spent the 2018 season with the Dayton Dragons of the Class A Midwest League where he hit .257 with 13 home runs, 47 RBIs, and 37 stolen bases in 120 games. On December 21, 2018, the Reds traded Downs to the Los Angeles Dodgers, along with Homer Bailey and Josiah Gray in exchange for Matt Kemp, Yasiel Puig, Alex Wood, Kyle Farmer and cash considerations. He began 2019 with the Rancho Cucamonga Quakes. Downs' brother, Jerry Jr., is also a professional baseball player. Omar Estevez (born February 2, 1998) is a Cuban professional baseball shortstop for the Los Angeles Dodgers organization. Estevez plated for Matanzas in the Cuban National Series as a 16-year old during the 2014-2015 season. He signed with the Dodgers as an international free agent in November 2015 for a $6 million bonus. He made his professional debut with the Great Lakes Loons of the Midwest League in 2016, hitting .255 in 122 games. Estevez was promoted to the Rancho Cucamonga Quakes of the California League, where he spent the 2017 and 2018 seasons. Anthony D. Gonsolin (born May 14, 1994) is an American professional baseball pitcher in the Los Angeles Dodgers organization. Gonsolin attended Vacaville High School in Vacaville, California and played college baseball at St. Mary's College of California. He was drafted by the Los Angeles Dodgers in the ninth round of the 2016 Major League Baseball Draft. Gonsolin spent his first professional season with the Ogden Raptors and Great Lakes Loons, pitching to a combined 1-2 record with a 3.77 ERA in 19 relief appearances. He spent 2017 with Great Lakes and Rancho Cucamonga Quakes where he went 7-6 with a 3.86 ERA in 42 games. After spending his first two seasons as a relief pitcher, he was converted into a starter in 2018. He started the season with Rancho Cucamonga and was promoted to the Tulsa Drillers during the season. In 26 starts with both teams, he went 10-2 with a 2.60 ERA. The Dodgers named him as the organizations minor league pitcher of the year for 2018. He began 2019 with the Oklahoma City Dodgers. Josiah Gray (born December 21, 1997) is an American professional baseball pitcher in the Los Angeles Dodgers organization. After not being heavily recruited out of New Rochelle High School, Gray accepted a scholarship to DII LeMoyne College in Syracuse, NY. He spent his first two seasons with the Dolphins splitting time as a shortstop and a pitcher before transitioning to the mound full-time as a junior. Gray was drafted by the Cincinnati Reds in the second round of the 2018 MLB draft. He signed and made his professional debut with the Greeneville Reds, going 2-2 with a 2.58 ERA in 12 starts. Gray was traded to the Los Angeles Dodgers on December 21, 2018, along with Jeter Downs and Homer Bailey in exchange for Matt Kemp, Yasiel Puig, Alex Wood, Kyle Farmer and cash considerations. He began 2019 with the Great Lakes Loons. Marshall Austin Kasowski (born March 10, 1995) is an American professional baseball pitcher in the Los Angeles Dodgers organization. Kasowski attended Oak Ridge High School in Conroe, Texas and played college baseball at the Panola College, the University of Houston and West Texas A&M University. In 2015, he suffered serious head injuries in a car accident that nearly ended his baseball career. Kasowski was drafted by the Los Angeles Dodgers in the 13th round of the 2017 Major League Baseball draft. He spent his first professional season with the Arizona League Dodgers and Great Lakes Loons, pitching to a combined 1-1 record with a 3.18 ERA in 11.1 innings pitched. 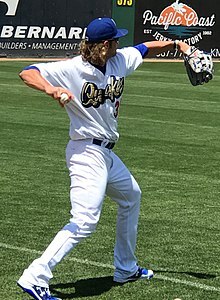 In 2018, he played for Great Lakes, the Rancho Cucamonga Quakes and Tulsa Drillers. In 41 games between the three clubs, he pitched to a 2-1 record with a 2.09 ERA, striking out 111 batters in 64.2 innings pitched. He began 2019 with the Oklahoma City Dodgers. Gavin Thomas Lux is an American professional baseball shortstop in the Los Angeles Dodgers organization. He played high school baseball for Indian Trail High School and Academy in Kenosha, Wisconsin and was selected in the first round of the 2016 Major League Baseball Draft by the Dodgers. His uncle is Augie Schmidt. Lux was one of the top fifty high school prospects heading into the 2016 draft. He won the 2016 Wisconsin baseball Gatorade Player of the Year awards and Holy Rosary Sports Night Male Athlete of the Year Award in high school. He had committed to Arizona State University but was drafted by the Los Angeles Dodgers in the first round, (20th pick overall), of the 2016 Major League Baseball Draft. On June 16, 2016, Lux signed with the Dodgers for a $2.31 million signing bonus. The Dodgers assigned him to the Arizona League Dodgers to begin his professional career. At the end of the season he was promoted to the Ogden Raptors of the Pioneer Baseball League. Between the two levels, he played in 56 games with a .296 batting average and 21 RBI. Lux got a late start on the 2017 season as he dealt with a rib issue in spring training but he was assigned to the Class-A Great Lakes Loons of the Midwest League on April 19. He played in 101 games for the Loons, hitting .244 with seven home runs, 39 RBIs, and 27 stolen bases. He was promoted to the Rancho Cucamonga Quakes of the California League for the 2018 season and was selected to the mid-season all-star game. He was promoted to the Tulsa Drillers of the Texas League in August. He was named to the post-season all-star team with Rancho Cucamonga. and was also named the Dodgers Minor League Player of the year. In 116 games between Rancho Cucamonga and Tulsa, he slashed .324/.399/.514 with 15 home runs and 57 RBIs. Lux began 2019 with the Tulsa Drillers. Dustin Jake May (born September 6, 1997) is an American professional baseball pitcher in the Los Angeles Dodgers organization. May graduated from Northwest High School in Justin, Texas. He was selected by the Los Angeles Dodgers in the third round of the 2016 Major League Baseball Draft. He was committed to play college baseball for the Texas Tech Red Raiders, but chose to sign with the Dodgers for a $1 million signing bonus, forgoing his commitment. After signing, May made his professional debut with the AZL Dodgers, and spent the whole season there, posting an 0-1 record with a 3.86 ERA in 30.1 innings pitched. In 2017, he played for both the Great Lakes Loons and the Rancho Cucamonga Quakes, compiling a combined 9-6 record, 3.63 ERA, and a 1.15 WHIP in 25 games (24 starts) between the two clubs. On August 3, he made his first start for the Tulsa Drillers of Double A going 3 2/3 innings giving up five earned runs. In 2018 for the Quakes he was selected to the post-season California League all-star team. On September 14, he started the Drillers title clinching playoff game where he allowed two runs in five innings. In 23 total starts between Rancho Cucamonga and Tulsa, he was 9-5 with a 3.39 ERA. May began 2019 with Tulsa. Jacob Winfield Peter (born April 5, 1993) is an American professional baseball infielder in the Los Angeles Dodgers organization. Peter attended Mason City High School in Mason City, Iowa and played college baseball at Creighton University. He was drafted by the Chicago White Sox in the seventh round of the 2014 Major League Baseball Draft. Peter signed and spent 2014 with the Great Falls Voyagers and Winston-Salem Dash, posting a combined .332 batting average with two home runs and 26 RBIs. In 2015, he played for Winston-Salem where he compiled a .260 batting average with three home runs and 57 RBIs, and after the season played in the Arizona Fall League. Peter started 2016 with the Birmingham Barons and was promoted to the Charlotte Knights during the season. In 130 total games between the two teams, he batted .283 with six home runs and 53 RBIs. Peter spent 2017 with both Birmingham and Charlotte once again and slashed .279/.344/.417 with 13 home runs and 49 RBIs in 120 total games between both clubs. On January 4, 2018, Peter was traded to the Los Angeles Dodgers in a three team trade that also sent Scott Alexander to the Dodgers, Joakim Soria and Luis Avilán to the White Sox and Trevor Oaks and Erick Mejia to the Kansas City Royals. He spent the 2018 season with the Oklahoma City Dodgers, batting .243 with seven home runs and 34 RBIs in 107 games. He returned to Oklahoma City to begin 2019. Donald Scott Peters (born December 12, 1995) is an American professional baseball outfielder in the Los Angeles Dodgers organization. Peters attended Glendora High School in Glendora, California. He was drafted by the Chicago Cubs in the 36th round of the 2014 Major League Baseball Draft, but did not sign and attended Western Nevada College, where he played college baseball. After one year at Western Nevada, he was drafted by the Texas Rangers in the 36th round of the 2015 MLB Draft, but again did not sign and returned to Western Nevada. In 2016, he was the Scenic West Athletic Conference Player of the Year. After the season, Peters was drafted by the Los Angeles Dodgers in the fourth round of the 2016 Major League Baseball Draft and signed, turning down a scholarship offer from California State University, Fullerton. Peters was initially committed to Cal State Fullerton out of high school. Peters spent his first professional season with the Ogden Raptors where he posted a .351 batting average with 13 home runs, 48 RBIs and a 1.052 OPS in 66 games. He spent 2017 with the Rancho Cucamonga Quakes and was named to the California League mid-season all-star team. In 132 games, he batted .276 with 27 home runs and 82 RBIs, and at the end of the season, was named to the post-season all-star team and was selected as the California League Most Valuable Player. Peters spent 2018 with the Tulsa Drillers, batting .236 with 29 home runs and sixty RBIs in 132 games. He returned to Tulsa to begin 2019. Notably, Peters is the first player in baseball history to hit two home runs off of Madison Bumgarner in the same inning. Edwin Gabriel Ríos (born April 21, 1994) is a Puerto Rican baseball first baseman and third baseman for the Los Angeles Dodgers of Major League Baseball (MLB). Ríos was drafted by the Dodgers in the 6th round of the 2015 MLB draft out of Florida International University. Ríos began his professional career with the Arizona League Dodgers in 2015 but was quickly promoted to the Ogden Raptors of the Pioneer Baseball League. He hit .253 in 22 games for the two teams. He began 2016 with the Great Lakes Loons of the Midwest League, hitting .252 with six homers and 13 RBI in 33 games, earning a promotion to the Rancho Cucamonga Quakes of the California League, where he hit .367 with 16 homers and 46 RBI in 42 games. He was promoted again, to the Tulsa Drillers of the Texas League. He was named the Dodgers organizational minor league player of the year for 2016. Ríos was named as a starter in the Texas League mid-season all-star game in 2017. For the season, he played in 128 games between Tulsa and AAA Oklahoma City and hit .309 with 24 homers and 91 RBI. The Dodgers added him to their 40-man roster after the 2018 season. He returned to Oklahoma City to begin 2019. Errol Anders Robinson (born October 1, 1994) is an American professional baseball shortstop in the Los Angeles Dodgers organization. Robinson was drafted by the Dodgers in the 6th round of the 2016 MLB draft out of the University of Mississippi. He had previously played at St. John's High School in Washington D.C.. He signed, and in his debut season he hit .282 in 55 games for the rookie league Ogden Raptors in 2016 before splitting the 2017 season among the Great Lakes Loons, Rancho Cucamonga Quakes and Tulsa Drillers, hitting a combined .270 with seven home runs and 35 RBIs in 95 games. For the 2018 season he returned to Tulsa, slashing .247/.309/.353 with ten home runs, fifty RBIs, and 18 stolen bases in 117 games. Robinson began 2019 with the Oklahoma City Dodgers. Keibert Ruiz (born July 20, 1998) is a Venezuelan professional baseball catcher for the Los Angeles Dodgers of Major League Baseball (MLB). Ruiz was signed by the Los Angeles Dodgers as an international free agent in 2014 for $140,000. He made his professional debut with the Dominican Summer League Dodgers in 2015 and spent the whole season there, batting .300 with one home run, 19 RBIs, and eight doubles in 44 games. He spent 2016 with both the Arizona League Dodgers and the Ogden Raptors where he posted a combined .374 batting average with two home runs, 48 RBIs, a .412 OBP and a .939 OPS in 56 total games between both teams. In 2017, he began the year with the Great Lakes Loons where he was selected to the Midwest League mid-season All-Star Team and was then promoted to the Rancho Cucamonga Quakes of the California League. The Dodgers selected him as their Minor League Player of the Year for 2017 after he hit .316 with eight home runs and 51 RBIs in 101 games between Great Lakes and Rancho Cucamonga. 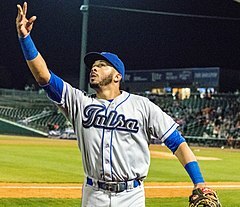 Ruiz was promoted to the Double-A Tulsa Drillers for the 2018 season and was selected to represent them at the mid-season Texas League All-Star Game. He was also selected to the "world" team at the All-Star Futures Game and to the Arizona Fall League Fall Stars game. In 101 games for Tulsa, he hit .268 with 12 home runs and 47 RBIs. The Dodgers added him to their 40-man roster after the 2018 season. Ruiz began 2019 with Tulsa. Jordan Ladon Sheffield (born June 1, 1995) is an American professional baseball pitcher in the Los Angeles Dodgers organization. He played college baseball at Vanderbilt. Sheffield attended Tullahoma High School in his hometown of Tullahoma, Tennessee. Before graduating, it was discovered that he needed Tommy John surgery, which caused him to fall in the draft. He was selected by the Boston Red Sox in the 13th round of the 2013 Major League Baseball draft, but did not sign and chose to attend Vanderbilt University. After sitting out the 2014 season recovering from surgery, Sheffield made 6 starts and 16 relief appearances for Vanderbilt in 2015. In 60 total innings, he would post a 5–2 win–loss record, 2.85 earned run average (ERA), and 55 strikeouts. Sheffield made 16 starts in the 2016 season, and pitched to an 8–6 record, 3.01 ERA, and 113 strikeouts in 101​2⁄3 innings. Heading into the 2016 Major League Baseball draft, Sheffield was ranked as one of the top available players by MLB and he was drafted by the Los Angeles Dodgers in the first round (36th pick). He announced on June 25 that he had signed with the Dodgers. Sheffield made one start for the rookie-class Arizona League Dodgers and seven for the Class-A Great Lakes Loons. He was 0–1 with a 3.75 ERA in 12 innings. Sheffield returned to Great Lakes to start the 2017 season, where he made 20 starts and was 3–7 with a 5.04 ERA. He was promoted to the Rancho Cucamonga Quakes of the California League at the end of the season, where he made four starts (and one relief appearance) and was 0–2 with an 8.00 ERA. He returned to the Quakes for the 2018 season, pitching to a 1-3 record with a 6.88 ERA in 14 games (seven starts). While playing for the Glendale Desert Dogs after the season, he was selected to the Arizona Fall League Fall Stars game. Sheffield returned to Rancho Cucamonga to begin 2019. His brother, Justus, is a pitcher in the Seattle Mariners organization. William Dills Smith (born March 28, 1995) is an American professional baseball catcher in the Los Angeles Dodgers organization. He was selected by the Dodgers in the first round of the 2016 Major League Baseball draft out of the University of Louisville. Smith signed on July 17, 2016 for a $1.775 million signing bonus. Smith began his professional career with the Ogden Raptors of the Pioneer Baseball League and was then quickly promoted to the Class-A Great Lakes Loons of the Midwest League. He played in seven games for Ogden, 23 for Great Lakes and 25 for the Rancho Cucamonga Quakes of the California League, hitting a combined .246. He was named to the California League mid-season all-star team in 2017. He hit .232 in 72 games for the Quakes with 11 homers and 43 RBI. He was promoted to the Double-A Tulsa Drillers of the Texas League in July, but suffered a fractured hand after getting hit by a pitch in his debut with the Drillers and he spent the rest of the season on the disabled list. Smith began 2019 with the Oklahoma City Dodgers. Mitchell White (born December 28, 1994) is an American professional baseball pitcher in the Los Angeles Dodgers organization. White attended Bellarmine College Preparatory in San Jose, California and played college baseball at Santa Clara University. He missed his freshman season in 2014 after undergoing Tommy John Surgery. He returned in 2015 as a relief pitcher and in 2016 became a starter. After his sophomore season, he was selected by the Los Angeles Dodgers in the second round of the 2016 Major League Baseball Draft. White made his professional debut with the Arizona League Dodgers. After two starts he was promoted to the Great Lakes Loons and ended the season with the Rancho Cucamonga Quakes. He did not allow an earned run in 22 innings over 11 games (six starts) for the three teams in 2016. In 2017, he made 19 starts across three levels, with nine for the Quakes, seven for the Tulsa Drillers and three rehab appearances for the Arizona Dodgers. He posted a combined 3–2 record with a 2.93 ERA and 88 strikeouts in 73.2 total innings pitched between the three teams. White spent 2018 with the Tulsa Drillers, going 6-7 with a 4.53 ERA in 22 starts. White returned to Tulsa to begin 2019. ^ McDaniel, Kiley (February 13, 2015). "Yadier Alvarez Emerges While Other Cubans Move Closer to Deals". Fangraphs. Retrieved July 2, 2015. ^ Townsend, Mark (February 15, 2015). "Meet Yadier Alvarez, baseball's next coveted Cuban prospect". Yahoo Sports. Retrieved July 2, 2015. ^ Sanchez, Jesse (February 17, 2015). "Acclaimed Cuban free agents highly sought-after". mlb.com. Retrieved July 2, 2015. ^ Wolf, Paula (February 13, 2015). "New rumor has Phils interested in Cuban pitching phenom". Lancaster Online. Retrieved July 2, 2015. ^ Gill, Mike (February 13, 2015). "Phillies Interested in Cuban Pitcher Yadier Alvarez". 97.3 ESPN South Jersey. Retrieved July 2, 2015. ^ Sanchez, Jesse (July 2, 2015). "Dodgers open int'l signing period with a flurry". mlb.com. Retrieved July 2, 2015. ^ Stephen, Eric (July 2, 2015). "Starling Heredia, Yadier Alvarez, Ronny Brito highlight Day 1 of Dodgers international signing period". SB Nation. Retrieved July 2, 2015. ^ Minami, Craig (June 21, 2016). "Yadier Alvarez strikes out 7 in debut, Arizona Dodgers take opener 8-7". SB Nation. Retrieved July 3, 2016. ^ "2016 AZL Dodgers Statistics". Baseball Reference. Retrieved August 7, 2016. ^ Bernreuter, Hugh (July 21, 2016). "Dodgers' prize prospect Yadier Alvarez dominates in Loons' debut". Mlive.com. Retrieved August 7, 2016. ^ "2016 Great Lakes Loons Statistics". Baseball Reference. ^ BA Staff (June 29, 2017). "2017 World Futures Game Rosters And Scouting Reports". Baseball America. Retrieved June 29, 2017. ^ "Yadier Alvarez Minor League Statistics & History". Baseball Reference. ^ a b Lewis, Barry (June 13, 2018). "Five Drillers selected for Texas League All-Star Game". Tulsa World. Retrieved June 17, 2018. ^ "Yadier Alvarez Stats, Highlights, Bio - MiLB.com Stats - The Official Site of Minor League Baseball". MiLB.com. Retrieved January 1, 2019. ^ a b c d Gurnick, Ken (November 20, 2018). "Prospect Ruiz among 5 added to 40-man roster". mlb.com. Retrieved November 20, 2018. ^ Editor. "Dresden baseball (Royal)ty is Beaty – NWTN Today". Nwtntoday.com. Retrieved August 27, 2017. ^ 9:48 p.m. CT June 11, 2015 (June 11, 2015). "MLB Draft: Beaty ready for new experience with Dodgers". Jacksonsun.com. Retrieved August 27, 2017. ^ Lewis, Barry (July 10, 2017). "Hot-hitting Beaty powers Drillers past Midland | Tulsa Drillers". tulsaworld.com. Retrieved August 27, 2017. ^ Lewis, Barry (January 1, 1970). "Drillers' Matt Beaty named Texas League player of the year | Sportsextralatest". tulsaworld.com. Retrieved August 27, 2017. ^ Lewis, Barry (September 4, 2017). "Drillers' Matt Beaty wins batting title". tulsaworld.com. Retrieved September 5, 2017. ^ "OKC Dodgers: Matt Beaty working way back to form". Newsok.com. May 31, 2018. Retrieved September 30, 2018. ^ "Matt Beaty Stats, Highlights, Bio - MiLB.com Stats - The Official Site of Minor League Baseball". MiLB.com. Retrieved January 1, 2019. ^ "Joe Broussard Stats, Highlights, Bio - MiLB.com Stats - The Official Site of Minor League Baseball". MiLB.com. Retrieved March 25, 2018. ^ "Joe Broussard Stats, Highlights, Bio - MiLB.com Stats - The Official Site of Minor League Baseball". MiLB.com. Retrieved January 1, 2019. ^ a b "Monsignor Pace (Fla.) baseball star Jeter Downs living up to name | USA Today High School Sports". Usatodayhss.com. Retrieved June 21, 2017. ^ Sheldon, Mark (January 20, 2016). "Reds take Jeter Downs at 32 in 2017 MLB Draft | MLB.com". M.mlb.com. Retrieved June 21, 2017. ^ Walter Villa (June 13, 2017). "Monsignor Pace shortstop is first local player picked in MLB Draft". Miami Herald. Retrieved June 21, 2017. ^ Sheldon, Mark (January 20, 2016). "Reds sign Jeter Downs, Stuart Fairchild | MLB.com". M.mlb.com. Retrieved June 21, 2017. ^ "Jeter Downs Stats, Highlights, Bio - MiLB.com Stats - The Official Site of Minor League Baseball". Retrieved December 10, 2017. ^ "Downs' career-high four hits fuel Dragons". MiLB.com. Retrieved December 14, 2018. ^ "Jeter Downs Stats, Highlights, Bio - MiLB.com Stats - The Official Site of Minor League Baseball". MiLB.com. Retrieved December 31, 2018. ^ a b "Dodgers deal Puig, Kemp, Wood, Farmer to Reds". MLB.com. December 21, 2018. Retrieved December 21, 2018. ^ a b c "Omar Estevez Cuban & Minor League Statistics & History". Baseball Reference. ^ Stephen, Eric (November 22, 2015). "Dodgers reportedly add Cuban prospects Yusniel Diaz, Omar Estevez". SB Nation. Retrieved February 8, 2019. ^ "Scholtens, Gonsolin selected in 9th round of MLB draft". Dailyrepublic.com. Retrieved September 30, 2018. ^ "Sports agent pleads not guilty to Cuban player smuggling – Page 160709998 – The Reporter". Thereporter.com. Retrieved September 30, 2018. ^ "Sports agent pleads not guilty to Cuban player smuggling – Page 170419874 – The Reporter". Thereporter.com. Retrieved September 30, 2018. ^ "Tony Gonsolin Stats, Highlights, Bio - MiLB.com Stats - The Official Site of Minor League Baseball". MiLB.com. Retrieved January 1, 2019. ^ a b Young, David (September 17, 2018). "Dodgers name Gavin Lux and Tony Gonsolin minor leaguers of the year". SB Nation. Retrieved September 17, 2018. ^ "Josiah Gray Stats, Highlights, Bio - MiLB.com Stats - The Official Site of Minor League Baseball". MiLB.com. Retrieved January 1, 2019. ^ Dave Edgecomb (April 6, 2017). "Buffs' Marshal Kasowski Collects K's". Myhighplains.com. Retrieved September 30, 2018. ^ "Car Wreck Puts Kasowski On Right Path To Draft | BaseballAmerica.com". Legacy.baseballamerica.com. Retrieved September 30, 2018. ^ Gurnick, Ken (May 24, 2018). "Dodgers see ceiling, not injuries, in Draft". MLB.com. Retrieved September 30, 2018. ^ "ALUMNI NOTEBOOK: Oak Ridge alum Kasowski moved up to Double-A - The Courier". Yourconroenews.com. August 1, 2018. Retrieved September 30, 2018. ^ "Marshall Kasowski Stats, Highlights, Bio - MiLB.com Stats - The Official Site of Minor League Baseball". MiLB.com. Retrieved January 1, 2019. ^ Menaker, Elise (February 2, 2016). "Kenosha baseball player considered Top 50 HS draft prospect". WTMJ-TV Milwaukee. Retrieved June 4, 2016. ^ USA TODAY High School Sports (May 24, 2016). "2015-16 Gatorade State Baseball Players of the Year". usatodayhss.com/. Retrieved June 9, 2016. ^ Johnson, Mike (January 16, 2016). "Indian Trail's Lux a baseball star deluxe". Kenosha News. Retrieved June 4, 2016. ^ Boehler, Dave (March 30, 2016). "Future looks bright for Indian Trail's Gavin Lux". Milwaukee, Wisconsin Journal Sentinel. Retrieved June 3, 2016. ^ Van Vooren, Tim (May 16, 2016). "For Kenosha Indian Trail baseball player, it's ASU or the pros next year: "Either way, a win-win"". Fox 6 News. Retrieved June 4, 2016. ^ Hoornstra, J.P. (June 9, 2016). "Dodgers use 20th overall pick on shortstop Gavin Lux". Los Angeles Daily News. Retrieved June 9, 2016. ^ Gurnick, Ken (June 16, 2016). "Dodgers ink first-round Draft pick Lux". mlb.com. Retrieved June 16, 2016. ^ Kenosha News Staff (June 28, 2016). "Local briefs: Lux collects first multi-hit game". Kenosha News. Retrieved July 3, 2016. ^ Grennel, Michael (August 31, 2016). "Dodgers' first round pick Gavin Lux joins Ogden Raptors for homestand". Standard-Examiner. Retrieved August 31, 2016. ^ a b "Gavin Lux Register statistics & history". Baseball Reference. ^ "Dodgers' Gavin Lux: Dealing with rib issue". CBS Sports. April 11, 2017. Retrieved April 19, 2017. ^ Bernreuter, Hugh (April 19, 2017). "Dodgers send No. 1 draft pick Gavin Lux to Loons". Mlive.com. Retrieved April 19, 2017. ^ a b Lindskog, Mike (April 2, 2018). "2018 Roster Announced". milb.com. Retrieved April 2, 2018. ^ a b Bumbaca, Chris (August 21, 2018). "Bannon leads California League All-Stars". milb.com. Retrieved August 22, 2018. ^ "Gavin Lux Stats, Highlights, Bio - MiLB.com Stats - The Official Site of Minor League Baseball". MiLB.com. Retrieved October 10, 2018. ^ "Dodgers' Dustin May: Drafted by Dodgers with 101st overall pick". CBSSports.com. Retrieved February 24, 2018. ^ "Dodgers agree to terms with third-round pick". MLB.com. Retrieved February 24, 2018. ^ "Dustin May Stats, Highlights, Bio - MiLB.com Stats - The Official Site of Minor League Baseball". MiLB.com. Retrieved February 24, 2018. ^ "Dustin May makes first start for Tulsa Drillers". True Blue LA. August 3, 2018. Retrieved August 4, 2018. ^ "May helps Drillers win first Texas League in 20 years". milb.com. September 14, 2018. Retrieved September 15, 2018. ^ "Dustin May Stats, Highlights, Bio - MiLB.com Stats - The Official Site of Minor League Baseball". MiLB.com. Retrieved October 10, 2018. ^ jared.patterson@globegazette.com, JARED PATTERSON. "Former MCHS star Peter drafted by White Sox". Retrieved November 19, 2016. ^ writer, Steven Pivovar / World-Herald staff. "Peter's success no surprise to Servais". Retrieved November 19, 2016. ^ "Mason City's Jake Peter to play in Arizona league". Retrieved November 19, 2016. ^ "'Super-utility' man Jake Peter simply super at bat". Retrieved November 19, 2016. ^ jared.patterson@globegazette.com, JARED PATTERSON. "Mason City's Jake Peter says being one step from MLB 'surreal'". Retrieved November 19, 2016. ^ "Jake Peter Stats, Highlights, Bio - MiLB.com Stats - The Official Site of Minor League Baseball". MiLB.com. Retrieved March 23, 2018. ^ "Jake Peter Stats, Highlights, Bio - MiLB.com Stats - The Official Site of Minor League Baseball". MiLB.com. Retrieved January 1, 2019. ^ "Peters SWAC Player of the Year". NevadaAppeal.com. May 13, 2016. Retrieved August 27, 2017. ^ "WNC outfielder DJ Peters named SWAC Player of Year". Rgj.com. May 12, 2016. Retrieved August 27, 2017. ^ "Dodgers take D.J. Peters in fourth round". RecordCourier.com. June 14, 2016. Retrieved August 27, 2017. ^ MICHAEL GRENNELL, Standard-Examiner correspondent. "Ogden Raptors outfielders making an impact on the team and on each other". Standard.net. Retrieved August 27, 2017. ^ a b Lindskog, Mike (June 13, 2017). "Six All-Stars for Quakes!". Milb.com. Retrieved June 13, 2017. ^ "DJ Peters Stats, Highlights, Bio - MiLB.com Stats - The Official Site of Minor League Baseball". MiLB.com. Retrieved February 19, 2018. ^ "D.J. Peters Minor League Statistics & History". Baseball Reference. ^ Lindskog, Mike (August 22, 2017). "Peters Wins MVP; Quakes with Three All-Stars". milb.com. Retrieved August 22, 2017. ^ "DJ Peters Stats, Highlights, Bio - MiLB.com Stats - The Official Site of Minor League Baseball". MiLB.com. Retrieved January 1, 2019. ^ "Watch: Dodgers prospect takes Bumgarner deep—twice". SI.com. Retrieved January 25, 2018. ^ a b c d "Edwin Rios Minor League Statistics & History". Baseball Reference. ^ Stephen, Eric (September 2, 2016). "Brock Stewart, Edwin Rios named Dodgers minor league pitcher, player of the year". SB Nation. Retrieved September 2, 2016. ^ Tulsa Drillers (June 14, 2017). "Nine Drillers Named to 2017 TL All-Star Game". milb.com. Retrieved June 14, 2017. ^ 7:52 p.m. CT June 15, 2016 (June 15, 2016). "Ole Miss' Errol Robinson signs with Los Angeles Dodgers". Clarionledger.com. Retrieved September 30, 2018. ^ Lee, Tariq (May 30, 2014). "Ole Miss SS Errol Robinson to play in first NCAA regional". The Washington Post. Retrieved September 30, 2018. ^ "Slick-fielding shortstop Errol Robinson looks for more magic moments with Drillers | Tulsa Drillers". tulsaworld.com. April 4, 2018. Retrieved September 30, 2018. ^ "Errol Robinson Stats, Highlights, Bio - MiLB.com Stats - The Official Site of Minor League Baseball". MiLB.com. Retrieved January 1, 2019. ^ Tunney, Brad (March 20, 2017). "Loons Eye Dodgers Top 30 Prospects". Great Lakes Loons. Retrieved August 23, 2017. ^ Stephen, Eric (June 8, 2017). "Dustin May, Keibert Ruiz named to Midwest League All-Star team". SB Nation. Retrieved August 23, 2017. ^ Jackson, Josh (July 17, 2017). "Cal notes: Quakes' Ruiz shakes up South scene". milb.com. Retrieved August 23, 2017. ^ Stephen, Eric (August 23, 2017). "Walker Buehler, Keibert Ruiz named Dodgers minor league players of the year". SB Nation. Retrieved August 24, 2017. ^ "Keibert Ruiz Minor League Statistics & History". Baseball Reference. ^ a b Callis, Jim (October 29, 2018). "Vlad Jr., Whitley highlight Fall Stars Game rosters". mlb.com. Retrieved October 29, 2018. ^ "Keibert Ruiz Stats, Highlights, Bio - MiLB.com Stats - The Official Site of Minor League Baseball". MiLB.com. Retrieved January 1, 2019. ^ Gleeman, Aaron (April 11, 2013). "Gary Sheffield's nephew, draft prospect Jordan Sheffield, needs Tommy John surgery". nbcsports.com. Retrieved June 9, 2016. ^ a b "Jordan Sheffield Baseball Statistics". thebaseballcube.com. Retrieved June 9, 2016. ^ "MLB 2016 Prospect Watch". MLB.com. Retrieved June 9, 2016. ^ Gurnick, Ken (June 10, 2016). "Dodgers pick Vanderbilt right-hander at No. 36". Dodgers.com. Retrieved June 13, 2016. ^ "Instagram". Instagram. June 25, 2016. Retrieved August 27, 2017. ^ a b c "Jordan Sheffield Register Statistics & History". Baseball Reference. ^ DeVries, Matt (April 3, 2017). "Dodgers Set 2017 Loons Roster". milb.com. Retrieved April 3, 2017. ^ "Jordan Sheffield Stats, Highlights, Bio - MiLB.com Stats - The Official Site of Minor League Baseball". MiLB.com. Retrieved January 1, 2019. ^ "Five questions with Indians' Justus Sheffield". mlb.com. Retrieved July 31, 2016. ^ "Who is Justus Sheffield? Yankees get pitcher in Andrew Miller trade to Indians". nj.com. Retrieved August 2, 2016. ^ "Louisville baseball | Draft stock surges for catcher Will Smith". Courier-journal.com. Retrieved August 27, 2017. ^ Hoornstra, J.P. (June 9, 2016). "Dodgers use 32nd overall pick on college catcher Will Smith". Los Angeles Daily News. Retrieved June 9, 2016. ^ Stephen, Eric (June 18, 2016). "2016 MLB Draft: Dodgers reportedly sign catcher Will Smith, No. 32 overall pick". SB Nation. Retrieved June 18, 2016. ^ Leboff, Michael (June 30, 2016). "Dodgers' Smith smacks first pro homer". milb.com. Retrieved July 3, 2016. ^ Bernreuter, Hugh (July 2, 2016). "First-round draft pick Will Smith leads Loons to win in first game". Mlive.com. Retrieved July 3, 2016. ^ a b "Will Smith Register Statistics & History". Baseball Reference. ^ Stephen, Eric (July 15, 2017). "Dodgers catcher Will Smith on DL with broken hand". SB Nation. Retrieved September 11, 2017. ^ "Mitchell White Sows A Whirlwind With Whiffs". BaseballAmerica.com. June 16, 2016. Retrieved August 27, 2017. ^ Gurnick, Ken (January 20, 2016). "Mitchell White picked 65th by Dodgers in Draft | MLB.com". M.mlb.com. Retrieved August 27, 2017. ^ "Dodgers prospect Mitchell White becomes reluctant two-inning pitcher". MLive.com. August 16, 2016. Retrieved August 27, 2017. ^ "MWL notes: White excels despite short leash". MiLB.com. Retrieved December 14, 2018. ^ a b "Mitchell White Minor League Statistics & History". Baseball Reference. ^ "Mitchell White Stats, Highlights, Bio - MiLB.com Stats - The Official Site of Minor League Baseball". MiLB.com. Retrieved January 1, 2019.